Here are some of the rooms of the Villa. To discover the details, let’s check their description. 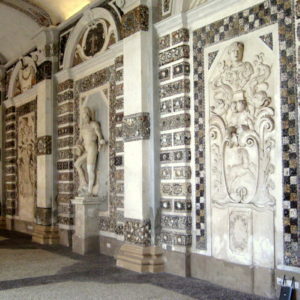 The Gallery of the Shells is located on the ground floor in the western wing. Today the long gallery is closed by large windows, but originally it was open. The delightful decoration, which follows Mannerism, consists of a series of relieves and cornices made of shell and reproducing figures of the underwater world (crabs, sea-horses, anchors). 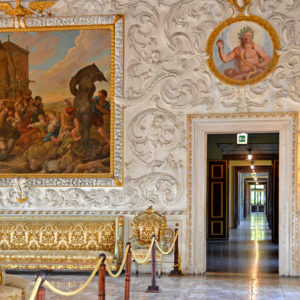 The gallery dates back to the 17th century, but the Camerini family, whose coat of arms appears on the floor in front of the Giants’ Stairs and in one of the relieves, introduced further elements. The gallery, restored in the 1920s, had been seriously damaged in the mid-18th century after being used as a stable by Austrian troops. The Well Room is on the ground floor in the main body of the building. 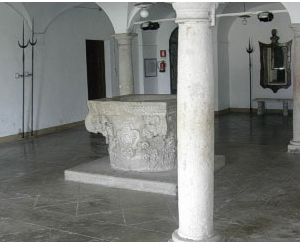 A valuable well curb of the 15th century was placed here by the Camerini family, while the Epigraphic Museum is on the ground floor in the eastern wing. 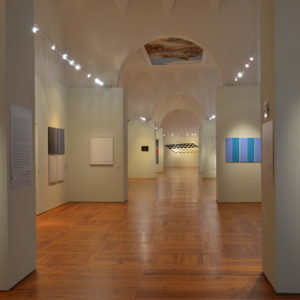 This museum now also includes the collection coming from the Nani Museum of Villa Pagani in Legnaro, which was moved here by order of the Camerini family at the beginning of the 20th century. The 18th-century collection is mainly made up of items coming from East and arrived to Venice as a consequence of the century-old relationships between the Republic and the Greek isles. The recently restored “Corridor” was conceived as an upper floor gallery used to reach the guest quarters and the noble chapel. The “Corridor” was certainly completed before 1681, as Jacques Chassebras de Cramailles, in his ‘Histoire de mes conquétes’, provides a description of it which visually corresponds to that included in ‘L’Orologio del Piacere’ (The Clock of Pleasure), published in 1685. 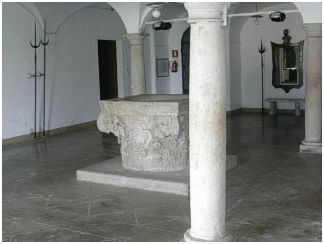 According to the description, the place was used as a promenade with a gallery on the upper floor. It was clearly built later than the façade of the right wing as can be seen in the clash between the architectural styles of the two parts of the building. 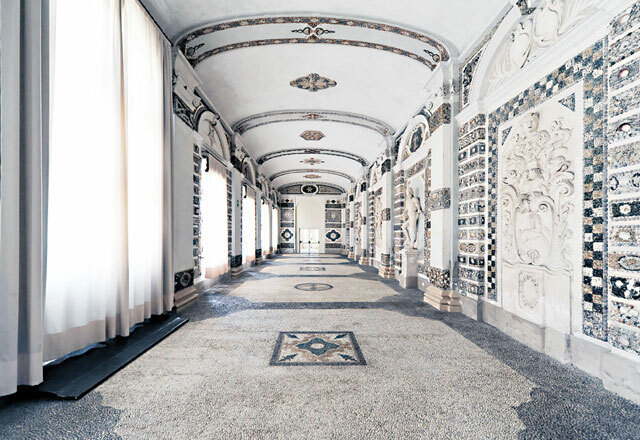 The design is reminiscent of Scamozzi for the layout of space, its depth and its use. Today the building is different from the original which was one span shorter and had a saddleback roof; moreover, as documented by the engraving of the 1685 and the relieve of the Villa made by Muttoni in 1740, there was a balcony overlooking the fish pond from where an audience could watch the shows and the naumachias that were held there. 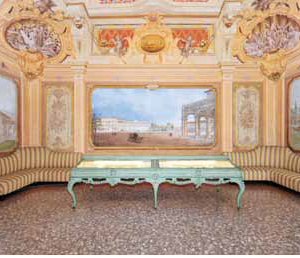 The Recreational Room illustrates, thanks to the portraits and paints all around, the major estates of the Camerini family. Next to the door one can see the houses in Carmignano and Taggì di Sopra. 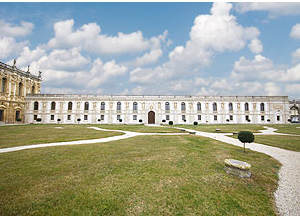 In front of the door there’s the Lumignano Red Palace while on the other side there’s the Villa of Piazzola. 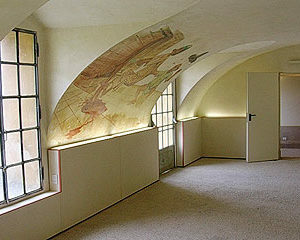 The frescoed gallery leads to the room of The Abduction of Proserpine. 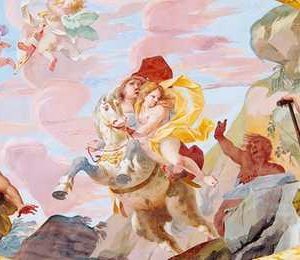 The mythological episode is portrayed at the centre of the ceiling: Proserpine is being abducted by Pluto, the god of the Netherworld, who tears her from her parents, Ceres and Jupiter, and takes her with him on his white horse. The picture is inserted into an elaborate painted architectural structure with double banisters: on the lower series there are the allegoric figures of Poetry, Painting, Sculpture, and Music to celebrate this place devoted to human arts. Poetry is carrying a book and some sheets bearing the date 1684, which corresponds to the year in which all the decorations commissioned by the Contarini family were completed, according to the critics. The same sheet also bears the initials MMP, recognized as belonging to Michele Primon, the painter. The initials should therefore mean “MICHELE PRIMON PINXIT” (painted by Michele Primon). 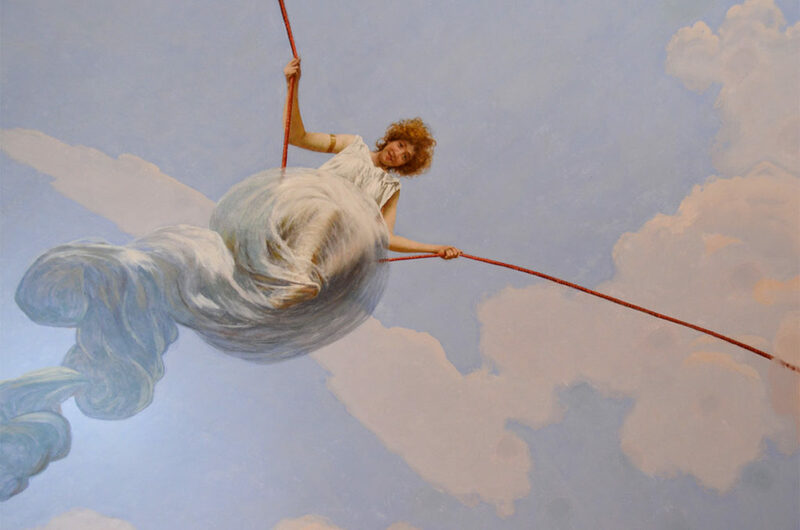 Moreover, there are pairs of cherubs sticking out from the banisters and holding spectacular purple curtains, similar to those hanging in the Caryatid Room and adorning the doors in the Allegory Room. Big monochrome medallions brightened up by cheerful cherubs stand out from them. Each medallion is set inside a niche partially hidden by the curtains whose upper part is topped by a vase full of flowers and sided by two cherubs. Fake niches with golden bronze statues are put at regular intervals along the walls; among them, there are a few Muses, Mercury with his traditional winged hat and his wand, Diana with her bow and a dog, and Minerva, the goddess who protects science and art, with her shield and helmet. 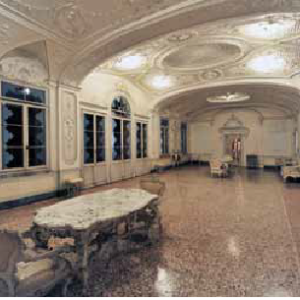 The Ballroom is also called Stuccos Room for its extraordinarily rich decorations that seem to cancel a well-established perception of interiors through the use of non structural elements, such as 17th century relieves of spirals or cherubs. There are a few paintings on the walls, such as the Shipwreck with the release of a slave, made by the Venetian painter Carlo Saraceni after he came back from Rome. Saraceni was hosted in Venice by Procurator Contarini, who probably deserves credit for commissioning this painting that was finished by Jean Le Clerc, who worked with the master. The ovals on the walls show Apollo with some allegorical figures carrying different musical instruments, while on the ceiling there is a fresco portraying Virtue driving away Vice; on the sides there are other allegorical representations: War with Mars and Venus, Justice with a sword and a scale, Peace, portrayed as a female figure carrying a cornucopia and an olive branch, and Nobility, depicted as a female figure carrying crowns. The frescoes, despite being repeatedly repainted, can be attributed to Gerolamo Pellegrini for the similarities with the pictures in the room of the musical instruments above, and, as the latter, must also be dated back to the year 1684. Finally, there is a remarkable fireplace with two reclining figures in the curved tympanum on top, which imitate the figures of Dawn and Twilight made by Michelangelo for the tomb of Lorenzo de’ Medici in the new sacristy of Saint Lawrence in Florence. 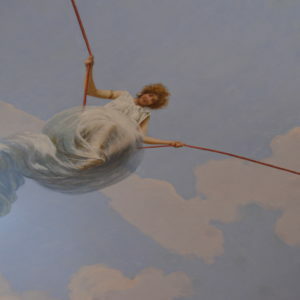 The Swing Room takes its name from the young woman swinging on a rope on the ceiling of the room. The paint was realized around 1900 by Pietro Pajetta. The frescos was not visible for lot of time since in the 1930s some works of renovation of the Library retook it to its original magnificence. 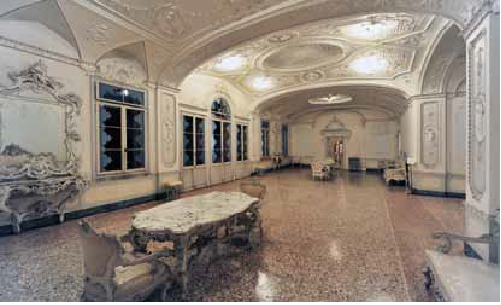 The room also hosts the marble sculpture of the “Venere su di un delfino che toglie il dardo a Cupido” by Ludwig Schwanthaler (1802/1848). 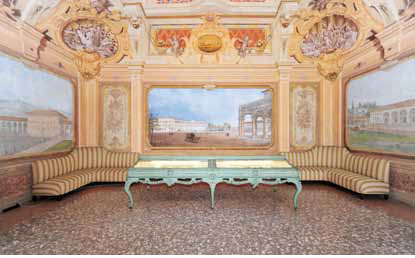 The Mirrors Room is the rococo style hall of Villa Contarini with its furnishings dating back to 1905. It is harmonized with the fine stucco decoration that combines 18th-century references to floral taste instances, made by Ferruccio Sanavio. 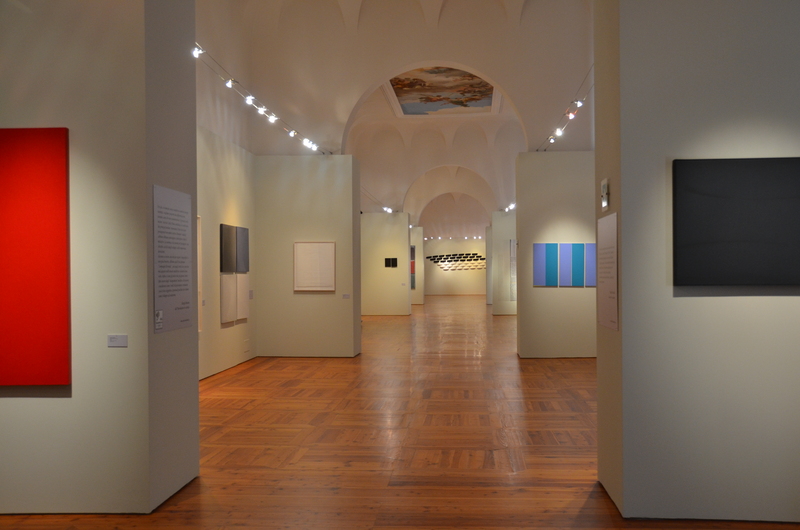 The Exhibition Hall, located on the first floor, is available for the realization of art exhibitions. For further information please contact Villa Contarini directly via the contact form. Behind the Shell Room you can find the German’s Cellars, they were used as refreshment point by the German troops in service during the Second World War. 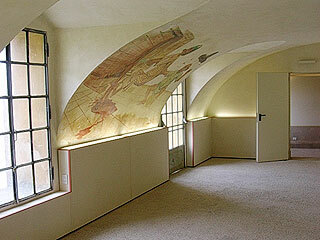 The walls are decorated with paintings made by the military themselves.